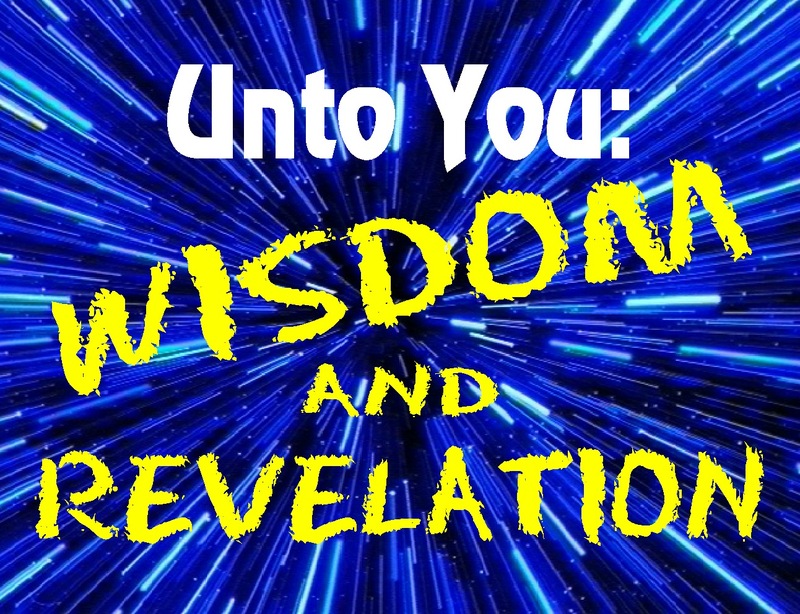 This week, the Lord has been speaking to me on many levels about wisdom and revelation. It will be of vital importance for the Church in the days ahead, and it is essential for every day life as a disciple of Christ. Wisdom is defined as a wise attitude, belief, discernment, insight, and perception. Revelation is defined as an act of revealing or communicating divine truth, something that is revealed by God to humans. How does one get wisdom or insight? The bible is very clear on that - Proverbs 1:7 The fear of the Lord is the beginning of wisdom. We must first fear the Lord. We must have a reverential fear of who God is. Do you believe this? Do you understand that EVERYTHING we have, we get to do, the air we breathe, our finances, the time we have comes from Him! (James 1:17) He is in control of all! He gives us free will to steward what He has given us. At any given time, some or all of what we have could vanish. So the question is, how do we steward what He has given us while we are on this earth? Many believers think that wisdom can only come from reading the Word of God. The Word of God is absolute truth and there is no denying the great wisdom that is in the Bible! It's a great place to start and definitely a must to put man's teachings to the test. However, I believe that there is more than one way to get wisdom and revelation. Ken's life verse is Jeremiah 33:3 - it says - Call to Me and I will answer you and tell you great and unsearchable things you do not know. A verse the Lord highlighted to me years ago was Revelation 4:1 Come up here and I will show you what must take place after this. Matthew 11:15 says He who has hears to hear, let him hear. These are all verses that are at any believers disposal to use. These verses are ones that have opened many doors into revelation that we could not of got any other place. Remember, revelation means something that is given to us direct from God! Dan Stone in his book The Rest of the Gospel, When The Partial Gospel Has Worn You Out writes - "Wisdom is revelation of the knowledge of God. Revelation comes in through our spirit and through experience". This means that if we ask God for wisdom, He will reveal things unknown to man through your spirit man and even through an experience that might seem unbelievable or "out-there" to others. God wants to give His children wisdom, insight and revelation in all that we do and say. Ken and I lead what we call "Treasurehunts". This is where we gather a group of people together and we ask the Lord for clues (revelation) on where to go, who to pray for and how to pray for them. I've shared some stories in previous posts. This is an example of asking for wisdom, asking for God's will. He freely shares with us. As we step out in faith and obedience (two main things that win you mega brownie points with God), He reveals things and people are blessed, encouraged, healed, whatever. There is nothing in the Bible that I'm aware of that would give you this experience or experiential knowledge? However, there is a verse in John that supports this - I only do what I see the Father doing. Another example of divine wisdom and revelation and health update: There are many, many, many folks praying for my healing and have for a long time! THANK YOU!!! It seems over the past 15-20 years, my health has been in a domino falling mode. One issue after another continues to spring up. People often ask how should I pray? Good question! Recently I was at a conference and the speaker called me up to pray for my healing. He had no knowledge of anything going on with me other than I had raised my hand when he asked if anyone had pain in their body. (He had prayed for several others before me, all of which the Lord gave him very specific revelation and many were healed instantly). Whoohoo! Praise the Lord! Anyways, when I got up there, he looked at me and said this "There is only one thing I know and that is you can do nothing". That one sentence was all I needed to hear to believe that he was legit and it was from God. (For months the Lord has been telling me that there is NOTHING I can do - my healing is in His timing and for His glory). 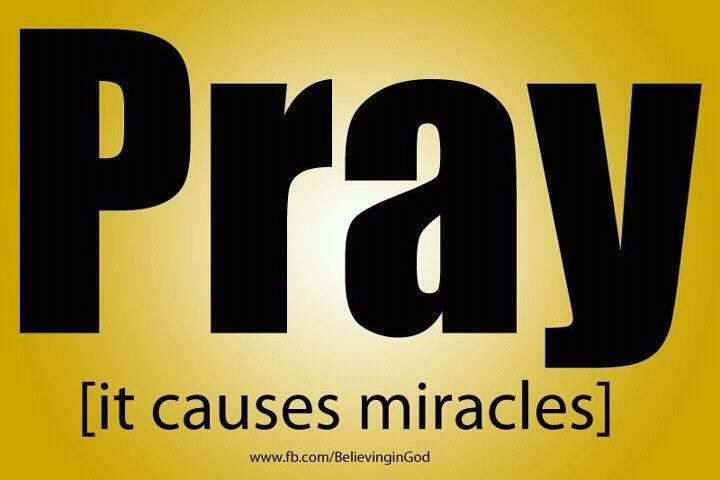 When he prayed for me, he asked the Lord to reveal what the cause of all my health issues were. Unfortunately, he did not get any revelation but told us to pray for specific revelation knowledge. He felt that was from the Lord. We did. I was going to see a new doctor that next week and so we began to pray for specific wisdom, insight and revelation to be given to this doctor. And you know what, God did just that. This doctor asked the right questions, discerned from my long history of issues and was able to find the very first domino that started this health mess! The good news is that we have an official medical diagnosis that very well seems to be the cause of at least 90-95% of all of what's going on. The bad news is that in the natural, the doctor only trying to be realistic doesn't have much confidence we will be able to reverse anything or stop my out of control body from getting worse. But...... my God is way way bigger than all of this. I feel the Lord has given me and a few others revelation knowledge on how to pray now for my healing and even the timing of my healing... and the experiential revelation is yet to come! Yippeee!! I will be FREE! I cannot wait!! "But for you who fear my name, the Sun of Righteousness will rise with healing in his wings. And you will go free, leaping with joy like calves let out to pasture. Summing all of this up. God wants us to be so in love with Him that we will desire nothing more than Him, that we are never truly satisfied with what we know. Ask Him to put a hunger and thirst in you that cannot be quenched! 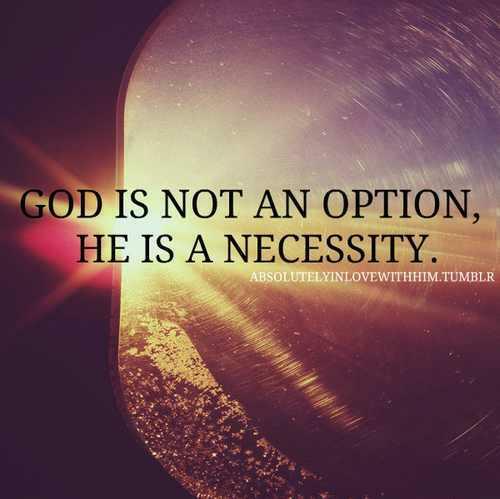 He is truly all we need to walk out the lives He puts before us. If we seek His Kingdom first, if we ask Him for wisdom and insight each day, even each moment, He will freely give us all that we need! With what is going on in the world, we need to be asking God for wisdom on how to pray and what we can do as the Church! It will take the Church working together and God's wisdom to help us navigate the days ahead. Your prayers are essential and they can change the course of things. What do you need wisdom on today? Are you facing some challenging times in your finances, health, marriage, business or anything else? We challenge you to meditate on those three bullet point verses above and ask the Lord for a very specific answer... so that when He gives you it, you will experience true revelation that comes only from HIM!!!! Proverbs 4:7 Also says the beginning of wisdom is this: Get wisdom and whatever you get, get insight! What does a marriage vow and a disciple of Christ have in common? Have you ever experienced a crisis in your life? Maybe the death of a loved one? A loss of a job? Loss of a child? Was there someone there for you that brought you comfort, offered up prayers, maybe even provided meals for you? How did that make you feel? Did you feel loved and cared for? I always love to see how the body of Christ (and even non-believers) step up when crisis hits someone they know. Today, I want to talk to you about the person or family that seems to be in a long long battle. Maybe someone dealing with a terminal illness, or chronic pain with no relief in sight. Maybe it's someone facing persecution because of their faith? What are you to do? Do you have any responsibility in this? Are you to pray for them? Are you to provide a meal? Are you to offer up whatever they need? And if so, for how long? The Spirit put two main things on my heart regarding this. 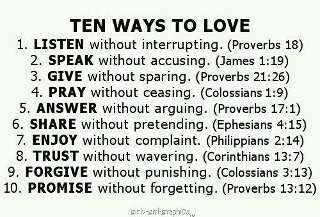 One is the marriage vow and another a Scripture. Have you ever looked at the marriage vow and let the words sink in? God calls us His Bride. If we are the bride of Christ? 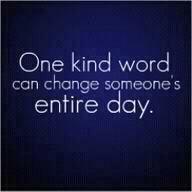 Wouldn't this "vow" apply to how we respond to fellow believers? Are we to love God and love others - for better or worse, for richer or poorer, in sickness and in health, to love and to cherish, from the day we invite Jesus into our heart, until He takes us home? God wired us all with a deep rooted need to be loved and to love, to be known and to know. There are many people hurting right now who need to know that God still cares about them. They need to feel loved and not rejected and most of all not judged. That just means, please don't be like Job's friends who assumed his suffering was due to sin. 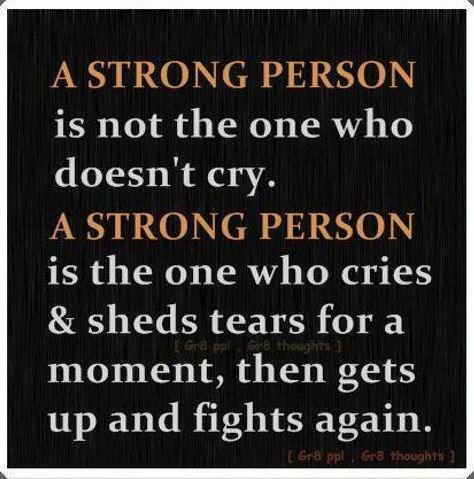 Who do you know that is going through some rough times? Have you reached out to them lately? Ask the Lord to show you who you can come alongside and then do whatever He asks of you! 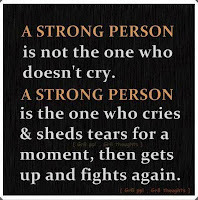 When hard times come to someone you know, will you walk every step of the way with them? Will you be a faithful disciple of Christ. Will you be a Bride that takes your marriage vows seriously! We covet your prayers - prayers for endurance, healing, provision, God's love to overtake us and however else the Lord leads. Friday 8/31 - we will be hosting a Shelf Reliance Food Tasting Show - email me for time and details michele@wantinsight.com http://kerryblack.shelfreliance.com. Check out the website. Great tasting, economical 25 year shelf life food. Come check it out if you are interested in learning more. Call (913)980-2059 Kerry Black if you want to order before the show. What do you do when you're tired, weary and ready to give up? What to do when you're tired, weary and ready to give up? Have you ever been in a position that you were completely at the mercy of another? Maybe you felt helpless or trapped wondering if things would ever change for you. What do you do when you're in this position? What do you do when God has promised you one thing but everything you see and feel in the natural screams the opposite? I'm tired, weary and ready to give up. I'm tired of pain! In just the past two weeks, I've been given two new health diagnosis! Osteoarthritis in my right leg for one - I have had 3 injections to help cushion the joints but the pain is still there. The doctor really doesn't have any hope unless these injections magically go to work (they should have by now). The second diagnosis is still in progress, but I woke up 10 days ago, not able to move. My back is in excruciating debilitating pain and having sciatica pain because of the back pain. I haven't slept in I can't tell you how long due to the pain. X-rays show that something is wrong in the lower back but further testing will need to be done. The doctor prescribed a strong anti-inflammatory in the meantime. NO! NO! NO! When I left the doctors office, I thought I would scream, instead I just cried. I couldn't even pray. I just kept asking God why? Why more pain? Why? Throughout my entire walk with the Lord, I have heard Him whisper to me "healing is coming". I even have felt I've heard Him say by this September. That's just a few weeks away. Is it possible? Of course it is if you believe the Scripture that says with God all things are possible? But in the natural when not one but two more chronic diagnosis get added to the already long list of issues, how do you continue to believe? What is the Lord trying to teach me that I have to endure even more pain? I've asked, I've listened and what I hear is "I am with you daughter". No offense God, I know that. And don't get me started on what others think the "answer" is! Sorry...just being honest! This is where I feel hedged in. I am at God's mercy! There really isn't anything I can do but beg for mercy to be able to endure. However, I feel that my prayers aren't worth the effort. What's the point? Now before you think that I've gone off the deep end or am turning away from the Lord, I am not! I am just being honest and real with you. For those of you who know me, know this is who God created me to be. In my quiet time Psalm 40:1-3 (amp) spoke to me. "I waited patiently and expectantly for the Lord; and He inclined to me and heard my cry. He drew me up out of a horrible pit [a pit of tumult and of destruction], out of the miry clay (froth and slime), and set my feet upon a rock, steadying my steps and establishing my goings. And He has put a new song in my mouth, a song of praise to our God. Many shall see and fear (revere and worship) and put their trust and confident reliance in the Lord". I've read this Scripture many times, in fact it was already underlined in my bible. So I asked myself, have I been waiting patiently? Am I not learning patience so do I have to go around the mountain again? Am I not expectant? Has He heard my cry (cries)? Is that why I'm still in this pit of pain? When will the new song be put in my mouth? So again, I cried out to the Lord and asked Him, why Lord? When will I see my healing? (excerpt from my journal) And I hear "My grace is sufficient for you and you will see your healing soon. Very soon, my precious daughter. You have done nothing wrong. This is not a consequence. This is all for My glory. There is nothing you can do, there is nothing you have to do. Continue to trust and be confident in My love for you. My heart is for you. I am with you daughter. Rest in My Presence and wait expectantly for My timing". The Lord told me the body of Christ has been in a long season of great strengthening and faith building through our pain and suffering. Yours might not be health related, maybe financial or relational? God is preparing many of us for what lies ahead. The Church is taking on a new look. Our identity must be in Christ and Christ alone. Our identity is not in what we do, our titles, our positions, our bank accounts or "what" size church we go to. We are the Church. God is raising up people that will give Him all the glory (Isaiah 42:8) and not take any for themselves. God is a jealous God! God is raising up people that will give up everything they have for the sake of the gospel and for those who minister the gospel. This doesn't mean He is asking everyone to sell their home and possessions, but He is looking for hearts that will if He did! (2 Chron 16:9) God is raising up people that seek Him first (Matt 6:33) and who will heed the voice of the Lord. Do we turn to our pensions and bank accounts, false gods or things of this world for comfort and peace or do we turn to God and trust and believe that He will take care of all our needs (Phil 4:19)? What is it you do when you're tired, weary and ready to give up? Choose Jesus! 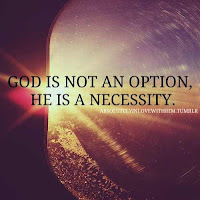 He is not an option, He is an absolute necessity! Don't give up - fight the good fight! God has given us the victory! If God has promised you something, believe for it. He is faithful and will keep His promise! I end with another verse that He gave me to meditate on. I pray it encourages you and it has me. Let's not be silent! Let's praise the name of Jesus forever and bring glory to His name!